Hanoi (VNS/VNA) - Many families in Hong Linh commune in Ha Tinh province still keep water pipes running from mountain creeks. Others in the province’s Thuan Loc commune prefer to use their wells, just in case tap water dries up. And over the last several years that seems to be the better option as there has often been tap water shortages during the hot season. In many other parts of the province, clean water shortages happen all the time. In Thach Tri commune, residents have to buy canned clean water for daily use at high price, in Duc Tho and Can Loc districts, people have to collect rain water and use water from lakes and ponds for washing and showering. Only 47 percent of Ha Tinh province’s population has access to clean water that meets national standard. Tran Van Hai, Chairman of the People's Committee of Duc Thanh commune in Duc Tho district, said he didn’t know when the situation would improve. “Finding a clean water resource for residents in the commune now seems hopeless. We have to use polluted water from wells and lakes and we have asked the higher authority for clean water, but all plans are still on paper," he said. And that’s just a small part of the bigger picture. 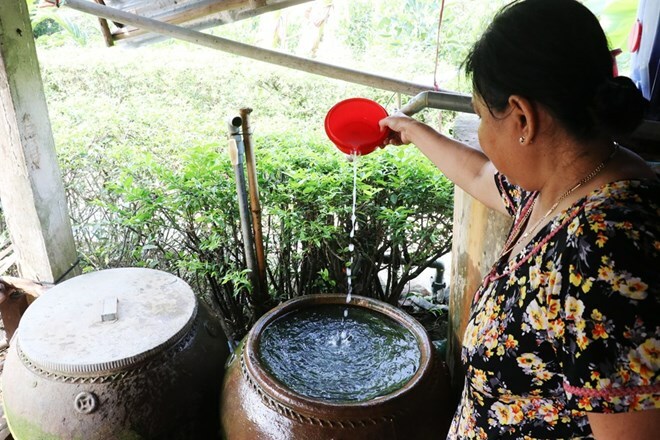 Five years after Vietnam launched its national action plan to improve efficiency in water resources management, protection and usage, only 49 percent of the country’s rural population has access to clean water. Vietnam has a dense network of rivers which should provide a more than adequate supply. But experts warned inefficient water management, along with the impacts of climate change, have resulted in shortages countrywide. The average water volume per capita is currently 3,400 square meters a year, which is expected to drop to 2,830 square meters by 2035. Meanwhile, the International Water Resources Association (IWRA) classifies a nation with less than 4,000 square meters per person a year as water-stressed. Vietnam is estimated to consume some 80.6 billion cu.m of water per annum. The volume of water to be used by 2020 is likely to rise almost half of that again to 120 billion cu.m. The Asian Development Bank’s (ADB) has warned that around 8.4 million Vietnamese people or 9.66 percent of its population will likely suffer from water shortfall by 2050. Hoang Van Bay, head of the Department of Water Resources Management under the Ministry of Natural Resources and Environment, blamed the situation on bad management and a rise in illegal water exploitation. “We do not have proper database for water resources, we are lacking of qualified water management staff at localities,” he said. Le Duc Trung, head of the Mekong River Commission office in Vietnam, said rapid population growth and climate change had negative impacts on water security in the Mekong Delta River, home to 60 percent of Vietnam’s surface water. “Rocket population growth, expansion of agriculture activities and exploitation of water flow for power demand caused serious impacts on the quality and quantity of the water flow,” he said. Trung also said natural disaster and climate change impacts such as rising sea level and saline intrusion also threatened the region’s resources. In Rach Gia city of Kien Giang province, saline water intrusion last year was found almost 20 kms inland contaminating the freshwater aquifers and affecting wells and ponds used for drinking water. Deputy Minister of Natural Resources and Environment Tran Quy Kien said the future of water exhaustion would come true if nothing is done in time. “It’s necessary to have a review of the country’s total water surface and underground water quantity. Every organisation and individual needs to use water mindfully be it for agriculture activities, hydropower or other economic actitivies,” he said. Bay from the Department of Water Resources Management suggested strict enforcement of water resources utility and protection regulations should be implemented. Tight supervision on water exploitation should be conducted with the support of modern technologies; underground water exploitation should be limited, while searching for new water sources in regions where water is scarce should also be done quickly. He also emphasised the need to improve and revive polluted rivers, investing in water quality surveillance systems, wastewater discharge surveillance systems, and making rivers basin water management plans. Director of the National Centre for Water Resources Planning and Investigation Trieu Duc Huy said in the future, the centre will complete the national water resources plan along with relevant policies. Le Duc Trung from the Mekong River Commision office in Vietnam said Vietnam has been proactively co-operating with countries in upper Mekong River regions in sustainable water resources management, both bilaterally and multilaterally.